Delivering inspiring, creative and functional solutions. Let us share our insite ... with you. At Insite Studio we are passionate about landscape architecture and land planning. We are extremely involved in the industry, and wish to bring you the latest updates and trends from across the globe — not to mention what is happening right here in our West Palm Beach office. We look forward to your feedback and contribution. On January 24th, Insite Studio Principal Brian Terry obtained zoning approval from the Palm Beach County Board of County Commissioners for the redevelopment of 56 acres of the Boca Dunes Golf Course. The developer, Zom Living, will be constructing 354 multifamily units within the first phase of development, which is scheduled to begin in late 2019. Insite Studio has been working with the development team providing planning and landscape architecture services for this exciting project. The site, in West Boca Raton, has been designed to accommodate an additional 90 units to be built in a future phase. Amenities include the re-design of the 18-hole executive golf course, a resort style pool, dog park and extensive trail system. In early November, 2018 Insite Studio hosted a gathering of charitable clients, family and friends to watch the Georgia Bulldogs play the Kentucky Wildcats in a SEC showdown. While watching the game and enjoying traditional southern barbeque, guests were encouraged to donate or register in a silent auction. All proceeds of the event have since been donated to an exciting start-up project benefiting elementary school students in Palm Beach County. 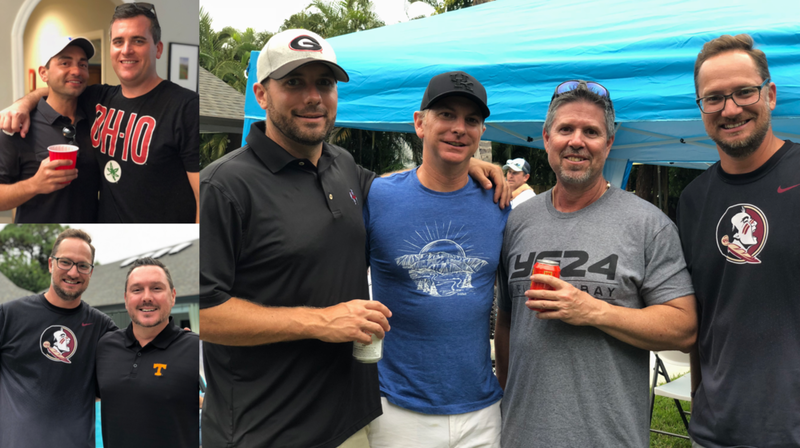 With generous donations from Frenchman’s Creek Beach & Country Club, Old Palm Golf Club and Woodfield County Club, Insite Studio raised $1300 for the Conservatory School at North Palm Beach Golf Club. The Conservatory School, in partnership with The First Tee of the Palm Beaches has started a golf club for local elementary school students. The Golf Club teaches the fundamentals of both golf and life to students at various facilities throughout Palm Beach County. The money raised with help construction of a synthetic turf putting green at the school. The event marks the first of many charitable events which Insite Studio plans to host to benefit specific charities and give back to the local community. The Palm Beach County business community has welcomed the newly- founded, Insite Studio, a Planning and Landscape Architecture consulting firm headed up by two experienced Landscape Architects, Brian Terry and Bryan Donahue. With over 30 years of combined experience, the businessmen and longtime friends are passionate about design, and believe a true hands-on approach is key to the successful design and completion of development projects. With the support of the Chamber of Commerce of the Palm Beaches, Insite Studio recently celebrated a ribbon-cutting ceremony with over 100 clients, colleagues, friends and family in their newly renovated offices located at 8144 Okeechobee Blvd. in West Palm Beach. “It was a small gesture to thank our colleagues, clients, family and friends that have helped us get started. A new business does not just develop overnight. We are very grateful for the support we have been shown over the last few months,” said Principal and Owner Brian Terry. Business partner, Bryan Donahue echoed Terry’s sentiments. “In our profession, we work hand in hand with our clients. From project conception to construction, we guide them through the process to make sure their initial vision is captured in the final built project.